Notice that the searcher misspelled my last name, transposing the “a” and the “r”. I don’t have “Agarwal” on my blog. (I do include both “Rakesh” and “Rocky” to help people find me.) Despite the typo, my blog comes up as the top result. This isn’t the “Did you mean?” spell check feature. The term is clearly misspelled, but the correct spelling is highlighted in the search results. Somewhere, Google decided that Agarwal = Agrawal. 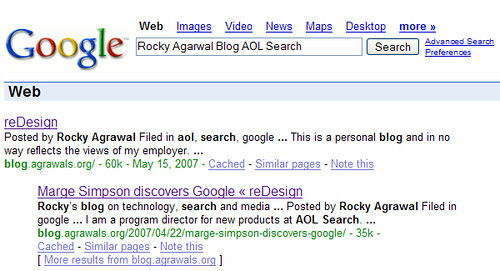 This also works on AOL Search, (powered by Google), but AOL does its own hit highlighting and the name isn’t highlighted. With Google’s strong international presence, they must be doing a lot of work on transliteration. This didn’t work with other transpositions or adding and removing letters. This entry was posted in google, search, seo. Bookmark the permalink.